Of all the Andersons directing movies like now like Wes Anderson, Paul Thomas Anderson and Paul W. S. Anderson (These kids are not related, but I think they are into some sort of conspiracy, hehehe), I probably like Brad Anderson the Best. After watching The Machinist. I got a bad taste in my mouth,which I also got while watching Fight Club and fuzzies, which I also got while watching Fight Club at the same time. This may lead you to conclude that this is another Fight Club clone, you may be right, but you are most likely wrong. Not being able to sleep for almost a year, Trevor Reznik's (a skeleton-like Christian Bale) mental and physical health is slowly but surely deteriorating. As stated in the movie "If he were any thinner, he wouldn't exist." He instead takes comfort in his relationships with prostitute Stevie (Jennifer Jason Leigh) and waitress Marie(Aitana Sanchez-Guijon) and her son. In the meantime he sorts out the identity of a mysterious co-worker who seems to be the source of many of the accidents in his workplace. The more he digs deeper into the issue, the more paranoid he gets...and the more fun we have. Highly stylized and well acted, The Machinist boasts of very rich use of color and shadows. The story also gets you gripped from beginning to end. Anderson was able to weave a tale that straight up gets the audience paranoid. He does it successfully by presenting a violent consequence for a certain irresponsible action and repeats the scenario making us anticipate and cringe in our seats, expecting another violent display. But Bale is the biggest reason why you should see this movie. It's mind boggling how he physically prepared for this role. His almost subhumanly frail and fleshless figure is almost nauseating. Dude, even drugs can't get you that thin that fast. He lost 63 pounds by eating only a can of tuna and an apple a day (i guess it does keep the doctor away! )Only months later, he was up in harnesses training form Batman Begins, this time with a more muscular figure. What did this guy do to get that thin? And how'd he recover? This comes to show how dedicated this guy is to his work. He probably sustained irreparable health problems getting that skinny. Well I guess it paid off. Oh yeah, he acts well too. 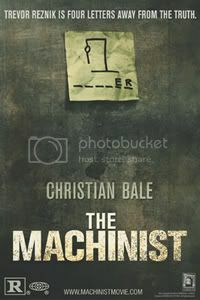 The Machinist rocks, go get it! looking at his still photos is sickening enough. i'd like to be thin... but not that thin!!! i dunno how he could even get up in the morning and act looking that frail! hmmm. try ko nga panoorin to. I enjoyed this movie. The concept was extraordinary and one of the best horror movies I have seen in my life. The suspense captivates and made me stick to my chair till the end. Preview: Steve Vai "Real Illusions: Reflections"